Signed and dated l.l., orange oil "Charles Conder/ .../ DEC. 1891-". Signed and dated l.l. corner, blue (ink?) "Charles Conder/ .../ 91". Art Gallery of New South Wales catalogue of British paintings , Sydney, 1987, 33 (illus.). Ann Galbally, Craft arts international , 'Charles Conder 1868-1909', pg. 81-83, Sydney, 2003, 82 (colour illus.). Charles Conder: the last bohemian , 'Algeria 1891-1892', pg. 89-95, Melbourne, 2002, 92, following 174 (colour illus.). Charles Conder: his life and work , London, 1914, 34-35, 94. Sasha Grishin., The Canberra times , 'Spirit of brilliance', Ainslie, 22 Jun 2003, (illus.). Exhibition review. Janet Hawley, The Sydney Morning Herald , 'A dandy in Bohemia', pg. 25-26, Sydney, 31 May 2003, 26 (colour illus.). Article appeared in Good Weekend. Charles Conder , Melbourne, 1972, 57. Art of Australia. Vol 1: Exploration to Federation , 'Individual and national feeling', pg. 545-610, Sydney, 2008, 549, 553 (colour illus. ), 554. Denise Mimmocchi, Australian Symbolism: the art of dreams , ‘Dreams of the bohemian idyll: Charles Conder and his impact’, pg. 90-110, Sydney, 2012, 100, 103 (colour illus.). Barry Pearce, Art and Australia , 'Recent Australian acquisitions with notes on Charles Conder's Algerian convalescence', pg. 57-62, Sydney, Spring 1984, 57-62, 61 (colour illus.). David Rodgers, Charles Conder 1868-1909 , Sheffield, 1967, 6. cat.no. 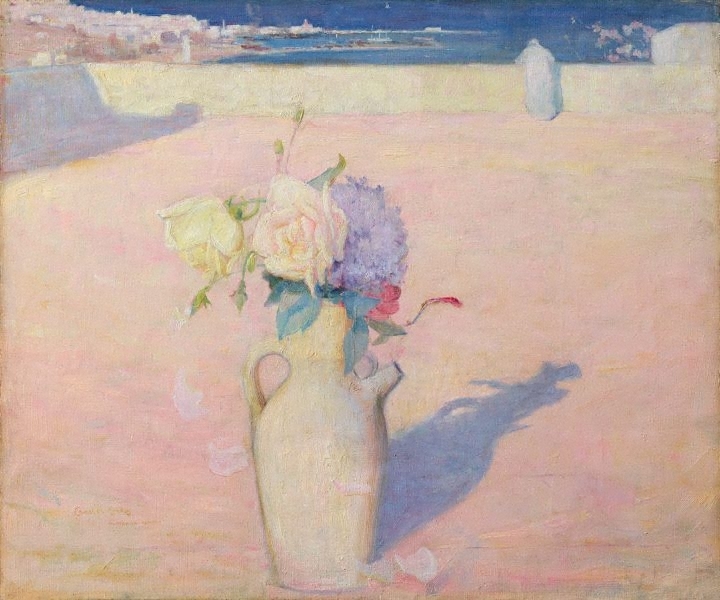 16; titled 'Flowers in a Vase against a Background of the Coastline of Mustapha, Algiers', oil , 18¼ x 21¾, Let by Sir Martyn Beckett, Bt. The life and death of Conder , London, 1938, 75, 78, 272. Martin Terry, Art Monthly Australia , 'Moulin Rouge: Charles Conder at the Art Gallery of New South Wales', pg. 31-34, Canberra, Nov 2003, 34 (illus.). Vivienne Webb, Australian art: in the Art Gallery of New South Wales , 'Golden age', pg. 37-38, Sydney, 2000, 38, 55 (colour illus. ), 300. Manchester Guardian , Manchester, 03 Feb 1883. Review by J.B. of the 1927 Tate exhibition in which the work 'The hot sands, Mustapha, Algiers 1891' was shown.